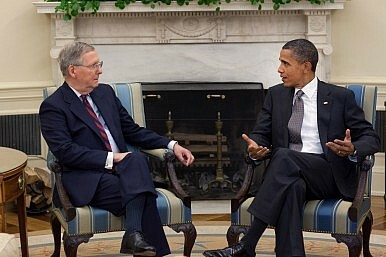 A Republican Senate might just be what the White House needs to build momentum on the TPP. Despite the Democratic Party’s best efforts, it is looking increasingly likely that tomorrow, when Americans head to the polls to vote for a new cohort of senators and representatives, Republicans will gain control of the Senate. Currently, psephologist extraordinaire Nate Silver gives the Republicans a 74.4 percent chance of winning a majority in the Senate. Similarly, Princeton’s Sam Wang also gives the Republicans a winning chance. Republican control of the Senate will almost certainly complicate the Obama administration’s ability to influence American politics and policy up to 2016 by introducing an almost intractable state of gridlock. However, a Republican majority in the Senate could also represent a breath of fresh air for the Trans-Pacific Partnership (TPP) — the economic pillar of Obama’s “Pivot to Asia” that has been under siege by congressional Democrats. Late last year, 151 House Democrats wrote the White House to express “serious concern with the ongoing negotiations over the Trans-Pacific Partnership.” “Specifically, we remain deeply troubled by the continued lack of adequate congressional consultation in many areas of the proposed pact that deeply implicates Congress’ constitutional and domestic policy authorities,” the letter stated. In March 2014, ahead of Obama’s Asia tour, 35 House Democrats and eight Senate Democrats wrote the president voicing their opposition to Japan joining the TPP talks. Most importantly, Democrats have long blocked Obama’s bid for “fast track” trade authority for the executive branch to help streamline negotiations. The TPP talks have grown increasingly complex and lethargic as more and more countries join the process with a varied list of conditions and demands. As John Hudson explains in Foreign Policy today, “Trade promotion authority legislation, or TPA, allows the president to submit a trade agreement to Congress for a straight up or down vote without any amendments” — this is what the Obama administration needs as it tries to push forward and win concessions from foreign governments. On the flip side, just over a week ago, U.S. Senator Rand Paul, a leader within the Republican Party and a 2016 presidential hopeful, called on Obama to prioritize the TPP. As Zachary Keck has written in these pages, the Republican Party, in general, remains more open to the idea of a pivot to Asia than the Democrats. Of course, knowing the nature of U.S. politics, it is imaginable that pro-trade Republicans could see blocking Obama’s foreign policy initiatives as a more worthwhile pursuit than actually granting the executive branch the authority needed to push ahead with TPP negotiations. Still, should the Senate turn red tomorrow, Republicans will come to control important congressional committees and will push out Democrats who would otherwise prefer insular trade protectionism. With two years left in his second term as president, Obama will likely follow the trend set by predecessors and focus more on foreign policy. While it may still be wishful thinking given pressing crises in Eastern Europe and the Middle East, the increasingly nebulous “Pivot to Asia” could become a topic of greater interest for this administration in these final two years. The White House has likely braced itself for impact tomorrow when the Republicans will likely emerge with newfound congressional influence. As it adjusts to working with a Republican Senate, the White House should take the initiative on reaching across the aisle for support on the TPP. A Hillary Clinton presidency would certainly present some challenges, but nothing U.S.-China relations can't withstand. The Partisan Nature of American Foreign PolicyWhy UK-ASEAN Trade Ties Are ThrivingThe Truth About Trump’s Trade TariffsWhy Abe Still Loves TrumpCan Japan Lead Asia's Economic Order?